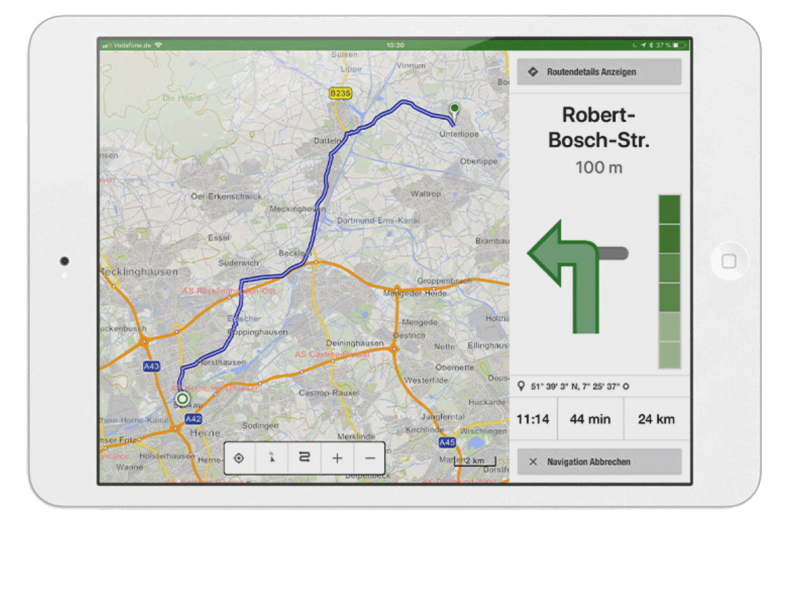 Professional navigation framework for mobile app development of flexible route profiles – from pedestrians to cars and emergency service vehicles to trucks and combine harvesters. The localion M framework allows straightforward integration of navigation functions into highly-specialised Android and iOS apps. John Deere looks to support customers in optimising their operating processes. The world’s largest manufacturer of agricultural machines increasingly provides this support through digital planning tools. A wide range of machine types must be efficiently coordinated in order to ensure a smooth process and high machine utilisation. Planning required a data basis which takes account of agricultural needs. Navigation design had to be flexible enough to reliably guide all vehicle types, from cars to combine harvesters, up to the point at which they enter the field. Vehicle-specific arrival times were a key planning factor in the overall process. 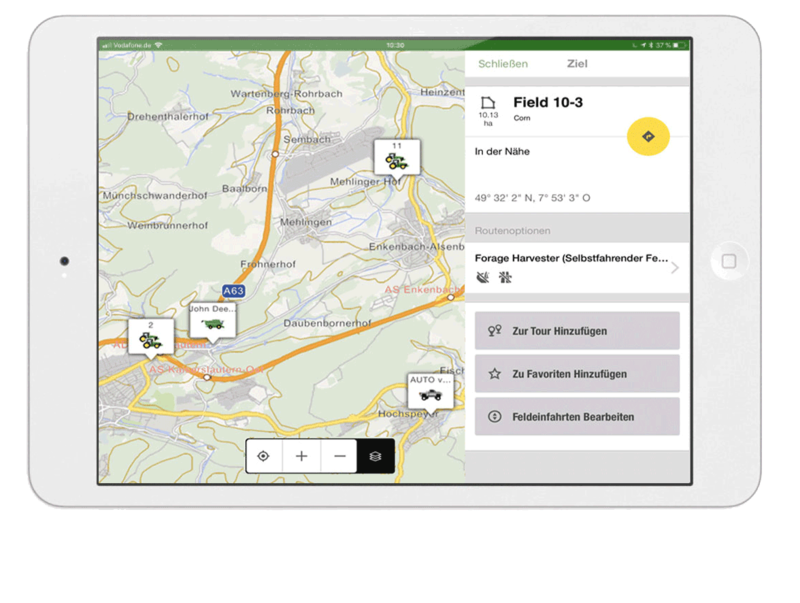 John Deere has implemented a mobile application which allows management of fields, orders and creation of a fleet. These resources were visualised on a map by localion M. Vehicle-specific parameters were used during route calculation and navigation. Map presentation, controls and navigation information were customised so that they fit the company’s corporate design. Navigation maps have been developed which take account of the special needs of agriculture. Flexible download of these maps allows the solution to be used throughout Europe. Localion M gave the customer a framework for map display, routing and navigation. The customer was therefore spared the difficulty of handling this complex issue and of cost-intensive in-house development. At the request of the customer, the package was tailored to create the best possible app user experience. The application was easily redesigned and new process flows supported thanks to localion M’s flexibility. The framework is continuously modified to keep pace with development of mobile platforms, and new functions are added. With Google Maps and Apple Maps, Android and iOS have their own navigation solutions and APIs. So why do I need localion M? Localion M from LOGIBALL is specifically aimed at professional users with broader requirements. The free navigation solutions from Google and Apple are primarily consumer navigators with limited options. In contrast to our business navigator, localion M is not a turnkey solution, but an SDK which can be used to realise your application quickly and, significantly, according to requirements. Developers can design the user interface to suit the application, and access the relevant localion M function through service interfaces. We also went the extra mile to provide industry-specific navigation maps with our xMaps, which contains relevant information for the deployed vehicles. What happens if I need a function which localion M does not currently offer? If this is a function which needs to be specially tailored to suit your scope, then just tell us the relevant user story. We calculate the effort estimation and let you know the sprint from which we can implement your requirement. We can create almost any solution thanks to full access to all sources and navigation maps. Why is localion M a long-term solution? The answer is quite simple. With localion M we created a business navigator which now has a five-figure number of users. localion M is therefore an SDK which has been tried and tested in use every day. As we are not active in the consumer sector, we always offer customers a long-term commitment to our products. The business navigator for the forestry sector was created 14 years ago. Companies and organisations need reliable solutions partners like us!